Earths in sight ! Does a world as ours exist within our Universe? It's been a mistery for thousands of years... Merely 20 years ago, the only known planets were the ones from our Solar system. Today, more than 400 planets were detected around other stars and this number increases constantly, a revolution of exosolar planets. Thanks to the ingenuity of astronomers and to increasingly powerful performing telescopes, we should soon reach the day that we can confirm the existance of a planet similar as ours. Come and discover new worlds! Celestial Splendours: the most striking cosmic scenery observed through the world's most powerful telescopes. If the stars can be seen, you will have the opportunity to gaze through the 61-cm telescope and use the magnificent observation platform with tilted benches. A breathtaking scene!If the sky is cloudy, the Observatory's multimedia equipment will be used for an Interactive Cosmos session. See our schedule in our Visit Us section. The evening is conducted in French. Reservations required for all astronomy evenings. The activities are conducted in French. 1-800-665-6527 begin_of_the_skype_highlighting 1-800-665-6527 end_of_the_skype_highlighting. If the stars are present, you will observe with eh 61 cm (24 inches) telescope and enjoy the special benches. If the sky is cloudy, we will offer a voyage in the Universe with our screens and our special presentations. Introduction to the star finder. Reservations necessary. See our contact information. 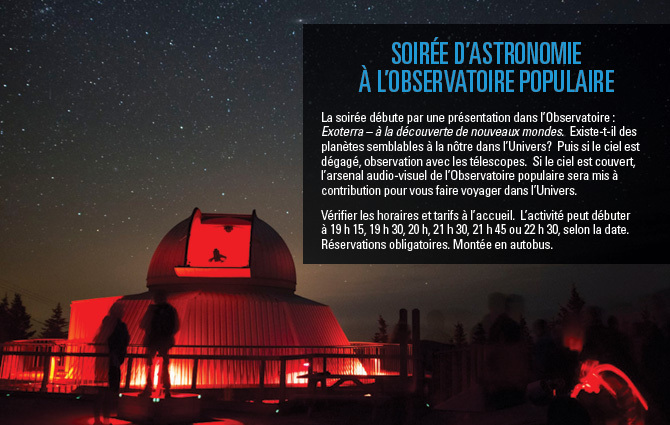 ASTRONOMY EVENINGS ARE CONDUCTED IN FRENCH.